Bagan, an ancient city located in the Mandalay region is one of the most visited places by tourists in the country. The city served as the capital of Myanmar from the 9th to 13th centuries. It was the capital of the Pagan kingdom, the kingdom which unified regions that constitute the Myanmar of today. The Bagan Archaeological Zone is the main attraction of the country and is one of the richest archaeological sites in Southeast Asia. Situated on the eastern bank of the Ayeyarwady River, the temples of Bagan leaves one awestruck. Bagan has approximately 2000 ancient monuments and pagodas strewn all over Bagan. The monuments are located on the land between the river bank and the Turintaung range. Although Bagan is most famous for its historic monuments, it has a lot more to offer. Tourists can visit nearby local villages and watch people weaving cotton. Bagan is famous for ancient craft, especially in lacquer. It is also famous for its mural painting, oil processing and palm sugar production. Origin: People with Myanmarese lineage live in Bagan. They mostly speak Myanmarese/Burmese and English and follow Buddhism, Christianity, Islam, Hinduism. Geography: The climate of Bagan is mild with no rainy season like a dry zone. 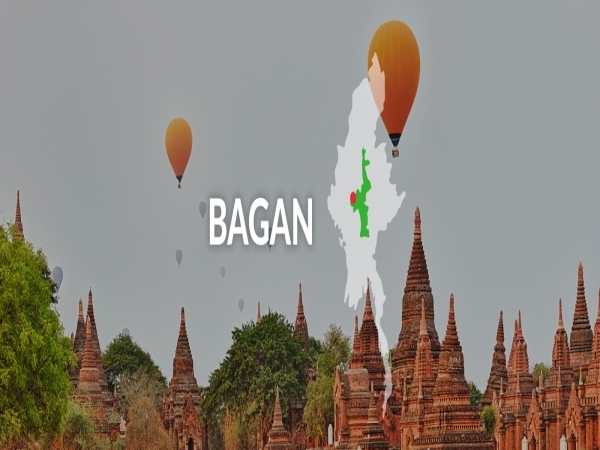 Extending over 37,024 sq km / 14,295 sq miles, Bagan is bordered by Sagaing Region, Magway Region and Shan State. Interesting Facts: History reveals that Bagan was the first ever capital of Myanmar. Currently, it boasts of around 2000 ancient temples and pagodas. At present, around 6.1 million people live here (2014). Bagan is famous for its historical monuments and houses around 2000 monuments from different periods. It is the most important historical site in Myanmar and is awe-inspiring. With a rich history of over 1500 years, Bagan stands evidence to achievements made by men before any technological innovation came into being. The walls of many of these monuments have historic mural paintaings which are a not to be missed site for tourists. Although Bagan has innumerable monuments, they do not look the same. In fact, the number of same types of monuments is very few, perhaps three or four. It is worthwhile to spend a day or two exploring the variety of monuments and pagodas. One of the best viewing points of Bagan is the top terrace of the Bagan viewing tower from where one can see temples literally till the horizon. A balloon ride over the temples is also a great way to enjoy the panoramic view. One of the best way to see Myanmar is to take a river on the Ayeyarwady River, the longest and the most important river in Myanmar. Tourists can enjoy a relaxing and comfortable cruise on the river. There is a range of options available to tourists – from traditional riverboats to luxury river cruises. In fact, one can take a river cruise from Mandalay to Bagan enjoy travel while enjoying the scenic beauty. Tourists can also visit places such as Mt. Sagaing, Pokokku, Myingyan and other well-known cities from Bagan through boats. Day trips are also available from Bagan to different locations. Tourists interested to enjoy the scenic beauty of Bagan can enjoy an evening cruise on the river. While enjoying the splendid sunset, tourists can also get a glimpse of the life of the local fishermen. Bagan provides a comprehensive cultural experience to tourists. It houses an archaeological museum inaugurated in 1904 where one can understand the rich history of Bagan. From Buddha statues to terra cotta work, the museum holds evidence to the 1500 odd year history of Bagan. Bagan also offers cultural experience to tourists. Pwa Saw of East Bagan and Minnanthu Village are famous for making cotton thread and weaving. Tourists can visit these places to see artisans at work as well as purchase products. Bagan lacquer ware is an ancient craft which is worth checking out for any tourists. The colourful products created are ideal to take back as memories of visiting Bagan. Bagan is also famous for peanut and sesame oil production and palm sugar production. Tourists can take a day trip to Sale Town, located 55 miles away from Bagan or the Zee O Village which is about half an hour away from Bagan. Ananda Temple one of the most popular temples of Bagan is situated to the south-east of Tharaba Gate. It is also one of the finest and most venerated temples. It was built by King Kyansttha in 1091 A.D. There are four huge standing Buddha images, each 10 metres high inside the temple and 80 relics depicting the life of Buddha from his birth to his enlightenment. Shwezigon Pagoda The sacred Shwezigon Pagoda is a solid cylindrical structure resting on three square terraces and is a prototype of Myanmarese style stupas. It was built by King Anawrahta and completed by King Kyansittha in 1087 A.D. It was believed that the pagoda enshrines the frontal bone and a tooth of the Buddha and is thus held in great veneration by the Buddhists in Myanmar. Dhamayangi Temple Bagan’s most massive temple, Dhamayangi Temple, was built by King Narathu in 1170 A.D. Although the temple construction has not been completed, it displays the finest brickwork and is worth a visit. Sulamani temple is situated one mile to the southeast of Bagan, beyond the Dhamayangyi temple. The highlight is an inscribed stone erected in the north porch mentioning that King Narapatisithu built it in 1183 A.D.
Thetbyinnyu Temple This temple is situated in the southeast corner of Bagan’s city wall and was built in 1144 A.D by King Alaung Sithu, the grandson of King Kyansittha. This is the highest temple of Bagan and rises to a height of 61 metres above the ground level. Archaeological Museum was inaugurated in 1904 near Gawdawpalin Temple in Old Bagan and reconstructed and reopened in 1997. The ground floor houses a display room where tourists can see objects of visual arts of the Bagan period such as terra cotta, stucco works, wood carvings, stone sculptures, metal works and lacquer work. Statues of Buddha and images of various makes, postures and styles are hosted on the second floor. Lawkananda Pagoda is a stunning golden pagoda located on top of a small hill on the banks of the Ayeyarwady River. This pagoda was built by King Anawrahta in 1059 A.D. The breathtaking view of the sunset from the pagoda is not to be missed. Tourists can see a replica of a tooth relic of Gautama Buddha here which was obtained by the king from Sri Lanka. Htilominlo Temple This pagoda is located at the northeast of old Bagan, on the Bagan-Nyuang Oo Road. It is one of the biggest and most beautiful temples in Bagan, built by Nataung Mya King in the 13th century. it is a large majestic structure almost 46 metres in height. One can observe the fine work of stucco on the outside walls of this temple. Myinkapar Gubyaukgyi It was built by Prince Rajakumar, son of Kyansittha in 1113 A.D and situated in the north of Myinkaba village. Mixed with Indian and Mon style influence, it is famous for its beautiful mural paintings. There are 550 jatakas on Buddha’s daily life, one of the main attractions of this temple. Manuha Temple is situated in Myainkaba village and was built by Manuha, the captive Mon King in 1059 A.D. The inscribed stone no. 9 in Mandalay says that King Manuha, who owned the 32 white elephants, built this temple with three colossal seated Buddha images, 14 meters high and a recumbent Buddha image, 17.6 meters long. The construction was completed in 6 months and 6 days. Mt. Popa is about 50 km to the Southeast of Bagan and takes about an hour and twenty minutes to drive. It is an extinct volcano covered with forest. It is a well-known pilgrimage site dotted with Nat (spirits) temples and relics. The panoramic view from the top of the rocky cliff is a memorable one. Tourists who like to engage in adventure can also hike to Mt. Popa. Yoke Sone Monastery A small town, Sale is 55 miles away from Bagan. It is characterised by colonial buildings and the Yoke stone monastery built by the Kone Baung Dynasty and Man Paya, an antique Buddha statue made of bamboo. It is also an important centre for lacquerware manufacturing in Myanmar. Zee O Village A 30 minutes drive to the southeast of Bagan will take one to the Zee O Village, famous for the enormous thousand-year-old tamarind tree, the remains of prehistoric blacksmith workshop sites and plenty of wood fossils. The local people believed that Zee O Village are is protected by the brother and sister guardian spirits (Nats). During a morning stroll, tourists can spot palm sugar production and tradition cooking oil processing process. Nga Tha York Village is about 16 miles away from Bagan but takes around 2 hours to reach due to the existence of sandy streams on the way. This village is famous for earthen ware and soya bean paste production. Cotton Waving Central Myanmar is famous for its cotton and cotton products production. Pwa Saw and Minnanthu Villages in Bagan are famous for cotton thread making and weaving. First cotton thread is made from raw cotton using machines and then clothes are made by weaving the threads on a traditional wooden loom. Tourists can visit these villages, see artisans at work and also buy some traditional Myanmarese cotton clothes. Oil Production Peanut and Sesame seed plants are one of the main crops of Central Myanmar. The produce is used to make peanut and sesame oil. The seeds are poured into an oil press which is a paddle turned around by ox. The oil comes out from a small hole at the bottom of the wooden mortar. The process is quite interesting to see and understand. Toddy Palm Central Myanmar is famous for growing toddy palm trees. The sweet sap is extracted from the toddy palm tree by climbing the palm tree using long ladders. The sap is then cooked for 2 hours until it settles down and becomes a paste. The end product is a sweet and healthy alternative to sugar. Tourists can observe this process while visiting any local village and also taste the delicious end product. Nanmyint Tower This tower is the best location to watch a panoramic view of all the temples of Bagan. The height of the tower provides a vantage point from where one can view temples in all directions. Tourists can catch a glimpse of the sunset or sunrise from this tower, a scene to be remembered a lifetime. Shwe San Daw Pagoda Another pagoda worth a visit is the Shwe San Daw Pagoda. King Anawrahta built this pagoda after his conquest of Thaton in 1057. This graceful circular pagoda was constructed at the centre of his newly empowered kingdom. The pagoda is also known as Ganesh or Mahapeine after the elephant-headed Hindu god whose images once stood at the corner of the five successive terraces. The Tharabar gate also known as Saraba Gate, is the most significant surviving gate among the 12 Gates, of Bagan. It is located to the east of the ancient city. It has two brick-walled shrines located opposite to each other. These shrines are of two guardian nats, named Min Mahagiri (Lord of the Great Mountain) and Hnamadawgyi (Golden face), who were executed by the order of a king. Ananda Pagoda Festival: This is one of the most famous pagoda festivals in Bagan and is believed to have been going on continuously since the Bagan period. Villagers come to the festival and make camps during the duration of the festival. Visitors can enjoy the traditional lifestyle of the locals of Bagan during this festival. Shwezigon Pagoda Festival: This festival is celebrated on the Full Moon Day at Nyaung U near Bagan. Celebrated for 15 days, the festival involves the ritual of offering a filled alms bowl to a thousand and more monks and novices. Lacquer-ware, glazed pots and hand woven cotton blankets are sold by villagers living in the region at this great country fair.